We are a family of 4, to adults and two teenage boys. We stayed at Sixty SoHo for 6 nights and had a great stay. Great location. Great staff. Great to have Leo right on site for breakfasts and other meals. Would stay again. 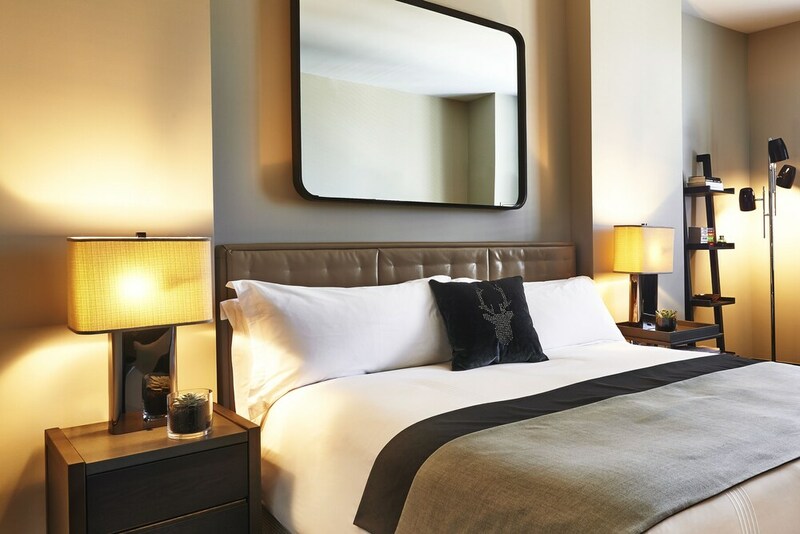 A great boutique hotel in Soho. Rooms are comfortable and bathroom was adequate. Staff are very friendly and accommodating, sharing the best parts of the neighbourhood with you. Great location to walk everywhere. Close to subway stops too. Sixty Soho has a cool vibe in the lobby and offers free wine between 4-5:00! Cool and comfortable seating areas and moody lighting provide a great spot to chat, work on your laptop, or read a book. The room was simple, but had cool style, too with a low back velvet sofa, comfy bed, stylish decor. Only complaint is that the bathroom mirror lighting was NOT good for applying makeup. Otherwise the marble bathroom was efficient and beautiful. This hotel has a womderful location in Soho. It is close to great shopping and restaurants. The room was omewhat noisy. It is definitely not quite as clean as it used to be. The outdoor cafe is very nice. We will be back to this outstanding hotel. Our room was beautiful and well appointed. There was also a fully stocked fridge with both soft and hard drinks -including perfect snacks. There were priced accordingly but it was so great to have the option to purchase something as such without ever leaving the comfort of your room. The bathroom was all tile with an open shower -very sweet! The staff were extremely helpful and went out of their way for us in every way. I had a fantastic experience staying at NYC's Trendy SIXTY SOHO HOTEL. My room was perfect, comfortable, quiet. The hotel Staff was very friendly, always available. The location was perfect, and rarely needed a taxi. I've stayed at many hotels in New York City, and Sixty Soho is my favorite. They also recently opened up a Sixty Hotel in Los Angeles, CA, and refer both hotels to clients. Thank you for making my stay enjoyable & for the wonderful experience. 5 Stars! Very nice Hotel in the middle of Soho. Close to all subway lines. Nice room design although the rooms were much smaller than expected and written on most websites (on the SIXTY Website where I booked it doesnt say anything). I was missing space in the cupboard, there was one cupboard with only hangers and two small drawers. Ok for one person but for 2 women it was hard, so we put our stuff in the bookshelf and on the Sofa. Bathroom was good, although any heating in the bathroom would have been nice at minus 10 degrees outside. Very beautiful lobby to spend time in, very nice concierge and doormen, nice restaurant for breakfast. We normally stay uptown in NY but decided to have a change and chose soho sixty in Soho . We will be back . A great boutique style hotel , but not OTT in finish and style . Location was tops , amenities great , beds comfortable . Price good for NY . Hard to fault . fantastic hotel, fantastic staff, great position, great bar. We had a lovely time and enjoyed the warm hospitality and great service here, i would totally stay there again when returning to New York. Shout out to Marcus who is the friendliest and most efficient doorman ever! From the moment we arrived here everything was top notch. Great beds, nice bath, super lobby bar, great people! Easy walk to NYU area, SoHo shopping and dining and drinks in the Village. I will return for sure. SIXTY SoHo places you in SoHo, within a leisurely stroll of popular sights such as Washington Square Park and 5th Avenue. This 4.5-star hotel has 97 guestrooms and offers conveniences like a restaurant, a 24-hour fitness center, and free in-room WiFi. Enjoy a leisurely bite to eat at Sessanta, the hotel's onsite restaurant. Order from 24-hour room service to satisfy your hunger without leaving your room, get a quick pick-me-up at the coffee shop/café, and mingle with other guests at the free daily manager's reception. For your convenience, a continental breakfast is available for a fee. An LCD TV comes with digital channels and pay movies, and guests can stay connected with free WiFi and wired Internet. Beds sport Egyptian cotton sheets and the bathroom offers a rainfall showerhead, a hair dryer, and designer toiletries. Other standard amenities include a minibar, a safe, and a phone. Guests of SIXTY SoHo enjoy a 24-hour fitness center, free WiFi in public areas, and a meeting room. Valet parking is available for USD $80.00 per day. The 24-hour front desk has multilingual staff ready to assist with concierge services, securing valuables, and dry cleaning/laundry. Other amenities at this luxury hotel include coffee/tea in a common area, a library, and express check-out. Sessanta - Restaurant and bar specializing in Italian cuisine. Open daily for breakfast, brunch, lunch, and dinner. Alfresco dining available (weather permitting). Above SIXTY SoHo - Rooftop bar specializing in American cuisine. Open daily. Alfresco dining available (weather permitting). Lobby Bar - Bar specializing in American cuisine. Open daily. Recreation features at SIXTY SoHo include a 24-hour fitness center.